The little mouse from the barbarian wilderness of Britain is taking Latin back to its Roman roots! 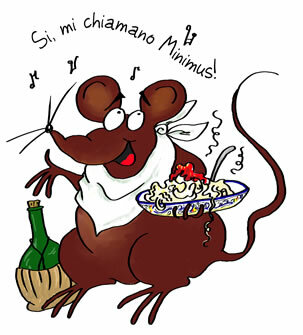 The Italian version of Minimus, by Barbara Bell and Elisabetta Valfrè, has been published by Loescher Editore of Turin. It's aimed at secondary pupils, and has 20 chapters which use the material from both Minimus and Minimus Secundus. There are some new picture stories (illustrated by Helen Forte), and the first part of the book is set in Rome. The Italian edition has considerably more formal grammar and exercises, in line with Italian teaching methods. It is the first Latin textbook published in full colour in Italy, and the designers have taken advantage of this to include a lot of beautiful photographs.